Lately I’ve come across one of those ‘secret’ brands you know is just going to be enormous but is still bubbling under. With Liberty and Questionnaire in Notting Hill as some of their listed stockists and with affordable price tags, it’s not going to be a best kept secret for long. Welcome to Muubaa. The sleekest, edgiest, London based leather brand that’s going to make waves, especially in a catwalk season (Autumn/Winter 2011) where leather is a key look. Muubaa’s core strength is its ultra attention to detail and its adaptability. This is leather wear for a new age: For the Hoxton hip, the Notting Hill Bohos, Clerkenwell ‘in’ crew and the well-heeled Mayfair glitterati. That’s the beauty of good design. It adapts to the wearer’s personality, style and surroundings. Something that Muubaa seems to excel at. Taking street style as its inspiration and advancing this while merging with militaristic elements, Muubaa’s Spring 2011 collection is just as big a hit with niche boutiques as it is with designer department stores and the Hollywood A-list as it is with London style setters. Celebrities such as Florence Welch, Kourtney Kardashian, Charlize Theron, Halle Berry, Selena Gomez, Mischa Barton, ‘The Saturdays’, Alexandra Burke and Cheryl Cole (well dur, obviously!) have all been spotted wearing these distinctively directional leather jackets. Muubaa’s unique look and feel comes through the brand’s attention to detail regarding design. They experiment and develop their unique leathers by using hand finishing, dye treatments, vintage wash effects, wired collars and cuffs and different contrast textures. Oh, and they’ve just introduced menswear for Autumn ’11. Concentrating on a contrast mix of directional trend styling with functionality, the designs are masculine, chunky and with a typical Muubaa twist. Keep your eyes peeled. Muubaa are set to rocket. 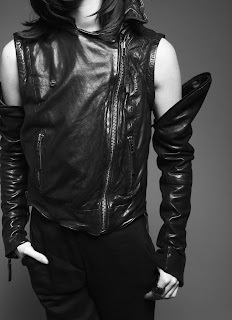 Muubaa pics are from their Autumn/Winter ’11 collection. Please let me know what you think of Muubaa in the comment box below. Thank you.